The Finch-Kennedy station is at a point on the corridor which is now a level crossing between Finch Avenue East and the railway. 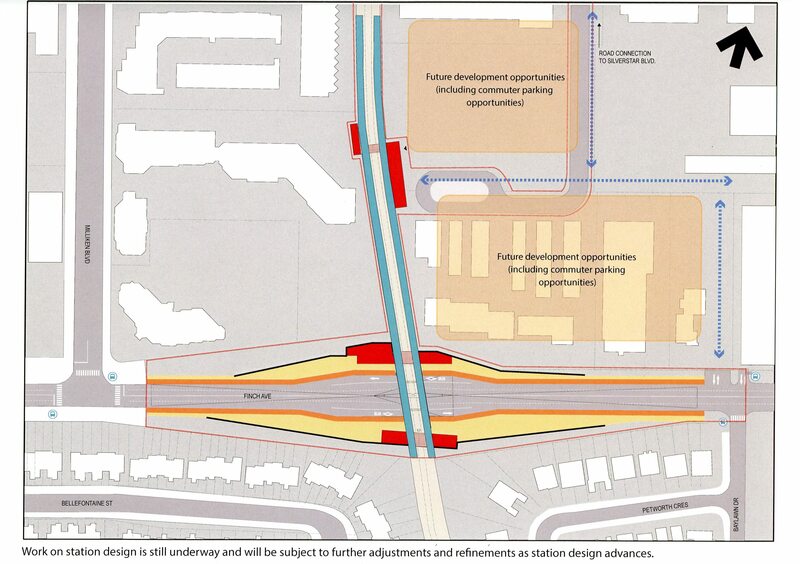 The proposed station would span a new underpass for Finch Avenue with connections to bus service in the underpass. The main station building would lie further north at a point where auto access would be provided for drop offs and pickups including Wheel-Trans service. As originally designed, the station had a fair amount of parking, but this has been dropped in the current plan although the diagram above notes the possibility for future addition of parking as part of redevelopment. New access roads (blue arrows) are shown for circulation to and from the station. Representatives of the Agincourt neighbourhood raised what has been a burning issue for residents around this stretch of the corridor. There are multiple grade crossings of the existing rail line and local streets, but Metrolinx proposes only to grade separate Finch and Steeles. See RER Level Crossings Strategy, February 2017. With a service plan of at least 7 and possibly 11 trains/hour in this corridor each way, grade crossings on the corridor would see a train either way quite frequently – just over every 4’17” on average for 7 trains/hour each way, or every 2’44” for 11 trains/hour each way). This raises issues for road capacity, pedestrian conflicts for crossings in residential neighbourhoods and constant noise from crossing alarms and train horns. Huntingwood : This is beside a school and students walk to and from it across the railway. Havendale : This is a residential neighbourhood that closely borders the corridor. Progress : This is in an industrial area. McNicoll : This is in an industrial area immediately adjacent to the new TTC garage now under construction. Passmore : This is an industrial area. The choice of grade separation locations depends on several factors including the frequency of GO trains. At the point where the current list was produced, service at 7 trains/hour each way was planned. If the actual number will be 11/hour, then the “exposure index” which drives the scoring process goes up by 57%, a very substantial increase that would definitely change the ranking of most if not all of the level crossings. Metrolinx needs to settle the question of service levels on this corridor (including any plans for expansion) and determine whether the decision to leave these grade crossings in place is actually justified. If not, then there will be both upheaval at the affected sites and an increase in RER project costs. Whether any of this becomes a SmartTrack cost remains to be seen. In either case, local municipalities bear part of the cost for grade separations, and this could be an as-yet missing cost within Toronto’s budget. The Lawrence-Kennedy station is a controversial location because of the political commitment that the SRT will remain in operation until the Scarborough Subway Extension (SSE) opens. As this is after the supposed launch of GO RER and SmartTrack in 2025, the two systems must coexist. This was not possible in the original design where the GO corridor, expanded to two tracks plus a central platform, would encroach on the existing northbound platform of the SRT. Because the RT line is in the way, there can be no access to the SmartTrack station both while the RT continues to operate and until the structure is demolished. Metrolinx proposes that access would be provided from bus platforms at the crown of the bridge over the corridor with vertical access down to the platforms via stairs, escalators and elevators (according to the March 6 presentation). At the March 6 presentation, the top-of-the-bridge transfer arrangement was presented as a positive change because 54 Lawrence East buses would no longer be delayed by looping through the station, and this would benefit through riders. The fact that a large number of riders are actually destined for this station, which is a short-turn point for the 54E express operation, appears to have escaped the presenters whose interest appears to be in making a bad connection sound better than it really is. If access to the bus loop were restored after the SRT station is removed, one must ask why the buses could not resume using that as their transfer point with a convenient across-the-platform access to the southbound platform. Northbound would require an underpass, possibly a continuation of the existing link to the SRT’s northbound platform. Why this is not in the station design is a mystery other than the high throwaway cost of using the bridge-based access for only a few years. The projected cost for the Lawrence-Kennedy station has not been released by Metrolinx, but the Star’s Ben Spurr reports that it is now $155 million, up from $23.2 million in the June 2016 Initial Business Case. That’s a lot of money for a station that will be entirely on Toronto’s dime, and with structures that could be obsolete a few years after it opens. This is the sort of ludicrous arrangement that passes for planning in Toronto. A much more sensible arrangement (assuming one agrees with the whole SmartTrack/SSE plan) would be to leave this site without a SmartTrack station until the RT is closed and its station removed, and plan for rapid construction of a replacement SmartTrack station as quickly as possible afterward. This will still leave riders of the Lawrence East bus without service for a period, but at a much lower cost and the possibility of building the station properly rather than shoe-horning it in beside an operating SRT line. Steve, seeing the rail arms drop every 4 minutes is not uncommon in other jurisdiction. I remember riding the Inuyama Line in Nagoya. There were 4 tracks and have many level crossing. There were local, express and an airport express all running. People avoided those areas by programming their GPS accordingly. People and cyclists did not have problems. If a train is travelling at 70 km/h, the gates are only down for a few seconds. It is not like a mile long CN freight train where people have to wait minutes for the arms to raise. Steve: I am not sure 70 km/h is a valid assumption given that the locals will be stopping at stations 2 km apart. Also, it is possible that Canadian regulations about the lead time for crossing arms to be down is greater than in Japan, but I will leave this question to those familiar with that detail. Leaving the discussion of the Kingston subdivision aside, an express service would require a lot of new tracks. From Kennedy GO to Unionville GO, it can be done with a quad track arrangement. The issue is where to find the space to put those tracks. 3 express trains per hour means one train every 20 minutes. A triple track arrangement will require fast trains with exact timing to share that track. Stations like Kennedy and Unionville would need at least 2 island platforms. They will be much bigger. Unionville is not an issue as there are a lot of land. Kennedy is constrained by the community center and the TTC station. The other alternative would be to add sidings at Lawrence East, Agincourt, Finch East and Milliken. Lawrence East might fit as long as Line 3 is removed. Adding sidings to Finch East and Milliken would require a wider bridge, but it will cost money and require land acquisition. Industrial land is much easier to acquire. Agincourt is a tough one as it is surrounded by residential area. An argument can be made to move the station further south. This way, when and if GO decides to use the CP freight line (mid town line), it would be a nice transfer station. Reading the Metrolinx electrification study, an EMU will shave 6 to 8 minutes on the Stouffville Line. Page 27 in this link. If stopping at the Smart Track stations do not add more than 8 minutes to the trip, EMUs will ensure that an all stop stopping pattern will not irritate the 905 riders. It must be pointed out that EMUs can accelerate at a rate 3 km/h per second versus about 1 km/h per second of the MP40. EMUs are also lighter which means that they can brake better. Since the Stouffville Line is very straight with few curves to Unionville, EMUs can be operated safely at 80 km/h instead of 70 km/h of the MP40. To see this effect, watch an ICTS car outaccelerate the MP40 at Kennedy. I will finish off by saying that speed is not everything. 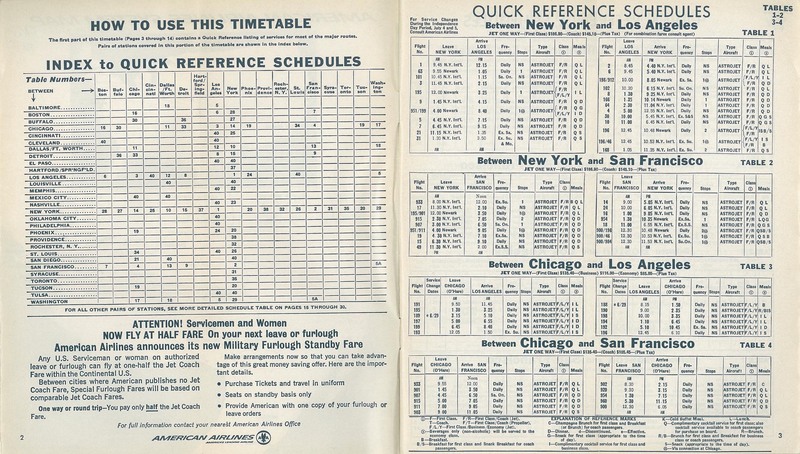 Here is a time table of American Airlines in 1963. Look at flight 001 between New York and Los Angeles. It departs 9:15 EST and arrives 12:15 PST. Look at the present day, Virgin America Flight 1407 leaves at 9:00EST and arrives 12:43 PST. People were moving faster in 1963 than today. Does that deter people from flying? Did people suddenly switch to driving on the Interstate or taking the Lakeshore Limited and then the Southwest Chief. The answer is no. People do not have a choice. If someone lives at Uxbridge, they will take the GO train to downtown even if it takes a few more minutes with an all stop. There is simply no other choice. I attended the Mar 6 meeting and read the Technical review. I’d like to thank Steve for his work, because what he points out, are things I totally missed. I was puzzled by the praises of “fare integration”. The report was highly favourable. I didn’t understand how fare integration was to be implemented so I asked everyone there, what it was about. Even in the question period, the panelists were vigourously challenged but totally evasive. For me fare integration means, a TTC ride costs the same on a TTC route and SmartTrack. It seems a GO/SmartTrack rider gets to transfer on to TTC as a transfer. Everyone was very clear, they don’t know how it will work. My personal view – the City has to pay for all operating costs of the City SmartTrack stations and a portion of the operating costs of the train service. It seems to me that these charges will be passed onto the TTC, resulting in an fare increase. Having off loaded some of their operating costs to the TTC, Metrolinx will reduce fares. Their hope is that the increased TTC fare matches the reduced GO/SmartTrack fare and it is called fare integration. There is no talk about the extra costs of providing TTC service to the GO/SmartTrack users. Do sufficient TTC riders benefit for their use of SmartTrack to justify the fare increase which everyone has to pay? As they work it out, it make be impossible to achieve fare integration. There are a lot of smart people who read this blog. How do you see it? Steve: Metrolinx has been evasive about what “fare integration” means for years while they push behind the scenes for their pet scheme, fare by distance at least for GO and the “rapid transit” network. Their opacity on the subject has reached the level of dishonesty because everyone things fares will go down when in fact for many fares would go up. The City and TTC staff and Mayor Tory don’t challenge Metrolinx on this because so much rides on the deal to pretend SmartTrack is a bona fide scheme rather than simply a way to get the City to pay for service that GO would have to provide anyhow. I’ve met several Metrolinx reps at different meetings. They are pleasant, intelligent young people who appear to have received a five minute briefing on each evening’s topic, before being sent into the fray. It’s as if they work for a different employer during the day. Of course, this is the ‘planning’ quality that Steve has complained about for years. My question is: Why can’t SOMEONE at Queen’s Park, in the 9-10 person cabal that runs our province, identify this problem to the rest of the group, and actually get them working on a solution. This was what I assumed the service would be after reading that technical report. That Metrolinx representative was either confused or completely bsing when they said local stations would receive 7 trains/hr. I wonder if Metrolinx really cares how incompetent they look. Steve: Other comments made during the meeting and scrum gave me the impression that they know they screwed up, although they won’t go as far as admitting it. Don’t forget that DumbTrack was proposed by a failed PC leader (John Tory). To ensure that we don’t revert back to the Mike Harris years, I will be voting Liberal this June and I dare say that Kathleen Wynne will win again. Steve: It would be nice to think that, but SmartTrack is of limited interest outside of a small part of TO, and I don’t think that John Tory’s foibles will rebound on the party of the same name. If anything, it will be seen as a case of the Liberals propping up the Mayor at the expense of a really stupid proposal, but ensuring that Toronto will pay for most of it. We better hope that the in-fighting withing the PC party prevents Doug Ford from being elected as the next Premier of Ontario otherwise then only thing being discussed in this forum will be the cuts to service that will inevitably apply. Any one who uses transit in Ontario especially those that use GO should be very concerned. I think that Paul Sherwood’s desired PC infighting will go on long enough to give the Liberals a chance. It would seem that Christine has now been ‘deprived of victory’ in two straight leadership ‘contests’. I don’t think that she is going to take it quietly this time. It would be great to see the Queen’s Park press corps get off their collective duffs and do a little writing on the inner workings of the Ontario ‘Progressive’ Conservative Party. Ontario’s future is on the line. There is nothing wrong with SmarTrack, GO or TTC learning how to run fast trains with exact timing to share limited track. I have seen this done well other places in Germany and Denmark and a side effect is that trains run on time simply because they have to for it to work at all. Can you say 4 trains an hour EACH direction every hour all day on single track with sidings and with diesel hydraulic trains? Steve: We are talking about a line where GO is planning 7 trains in each direction hourly and wants to increase above this. The window between trains is much shorter, and the scheduling/signalling challenges quite a bit higher. 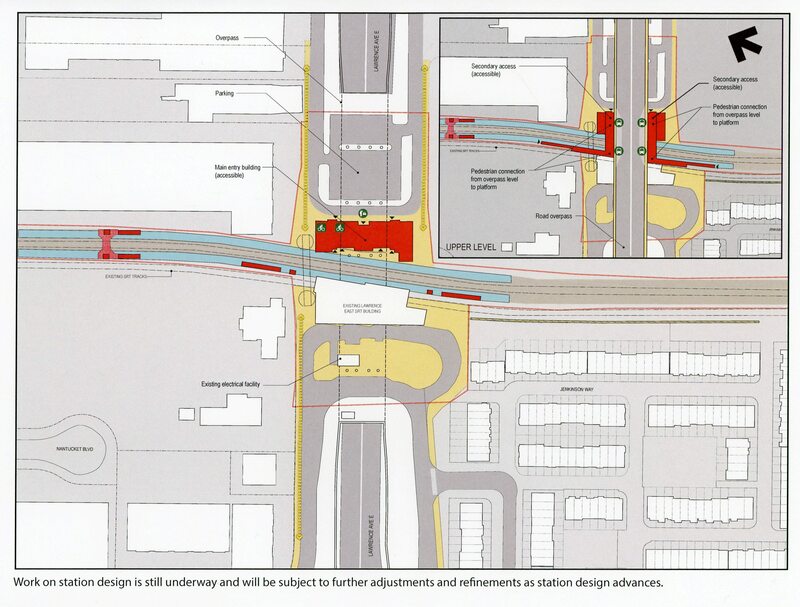 Here is the link with updated rendering of the three stations on the Stouffville Line. The Smart Track stations are not there on the bid. Based on the illustrations, there are no passing tracks. How the express trains will pass a local train remains to be seen. Also notice that there are no signs of hydrogen rail. Steve: This is a project that was already underway separate from SmartTrack and Hydrail. It is amusing that Metrolinx, who are so big on avoiding change orders, have let a contract whose design does not square with some of their current options. The SmartTrack stations have not yet passed Stage Gate 3 (30% design and pricing with approval to proceed to tender), and with some of the numbers leaking out of Metrolinx, they may never get further. Steve said: Also, it is possible that Canadian regulations about the lead time for crossing arms to be down is greater than in Japan, but I will leave this question to those familiar with that detail. This means the minimum time under Canadian law is 30 seconds. Using a standard GO Train (320m long, 320m SSD) and a 60kph road, you get 43 seconds in the closed position for a total of 70 seconds if the train is only going 70kph and not 70mph. With just 15 minute service, you are reducing the road through-put by 31% (140s of 450s between trains). Of the 185 public and 51 private at-grade crossings on the network, the would push dozens into a class F level of service (meaning the traffic never clears during the day). Benny Cheung said: From Kennedy GO to Unionville GO, [express service] can be done with a quad track arrangement. Triple track and well planned service should be sufficient. Benny Cheung said: Reading the Metrolinx electrification study, an EMU will shave 6 to 8 minutes on the Stouffville Line. Page 27 in this link. I wouldn’t trust that report to even hold the door open. They had to add a siding track on Stouffville just to make the whole model work. Check out Appendix 5. They have 30 seconds boarding at each station. If you listen the latest buzz, level boardings will save 30 seconds at each station! Benny Cheung said: It must be pointed out that EMUs can accelerate at a rate 3 km/h per second versus about 1 km/h per second of the MP40. Acceleration is normally done in m/s² not kph. Benny Cheung said: If someone lives at Uxbridge, they will take the GO train to downtown even if it takes a few more minutes with an all stop. Agreed. The biggest point raised by people using GO is avoiding traffic, not saving time. It’s lower stress and higher reliability. Bill R said: For me fare integration means, a TTC ride costs the same on a TTC route and SmartTrack. You see, people need to be clearer in their thoughts. You want SmartTrack added to the TTC network at $3.50 a ticket, not $7.00, right? The easiest way to give GO Transit rides for a TTC ride cost is to raise the TTC fares. Harrison said: They are pleasant, intelligent young people who appear to have received a five minute briefing on each evening’s topic, before being sent into the fray. It’s as if they work for a different employer during the day. To be fair, they are mostly Communications majors who specialize in public relations rather than actually working on these things on a daily basis. Steve: Thereby showing just how trivial the City and Metrolinx consider the whole process. I don’t care if you’re Communications person, not an engineer. It’s your job to understand the material you are presenting and especially not to freelance with made up “facts” when you cannot answer a question. Patrick Brown said: I will be voting Liberal this June and I dare say that Kathleen Wynne will win again. I think there needs to be some strategic voting around the NDP to not split the left too much. Hopefully, Doug Ford will shoot himself in the foot like Hudak did. Harrison said: It would seem that Christine has now been ‘deprived of victory’ in two straight leadership ‘contests’. Elliot also placed third in 2009.